Working with archaeological material is interesting and exciting, however the thrill and awe over how old the objects are have somewhat lessened through the years. Nonetheless, every now and then I get those thrills and they fill me with humility and admiration for the people who made and used the objects that are now 5000 years old, and ticking. Working with pottery, I am fortunate to be able to notice, from time to time, the odd fingerprint preserved in the clay of the vessel wall. Through the fingerprints the Stone Age people come very close and it is a humbling experience to realise that not that many events, throughout this object’s 5000 year old life, have passed between the fingerprint and me. It is truly a time-machine worth its name. Greg has told me that one of his time-machines is when he can see singular specific motions an ancient flint knapper took while chipping out a particular stone artifact. 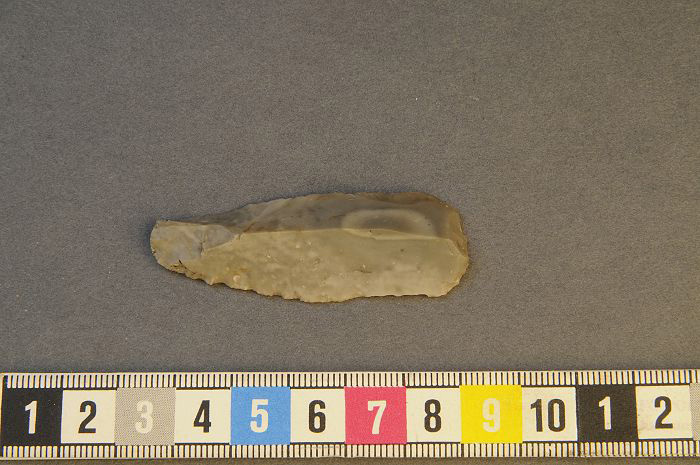 Greg admires this particular scraper (FID1185223) because he sees the skillful removal of a thin, straight blade from a prepared blade core as well as the decision to carefully round the distal end of it into a fine end scraper by means of selective pressure flaking. Photo: Greg Tanner, SHMM. Imagining that this world has gone through so much and that the people who have lived on this planet have struggled and suffered, prospered and rejoiced, all this, while the pottery and the polished axes were still in the mire as they were left by the Stone Age hands that made them. I often mention in this blog how fascinated I am by the fact that so much organic material has been preserved for us to see. I guess that is because they also represent small time-machines in themselves, especially seeds and plants. They are so close, so unaltered. 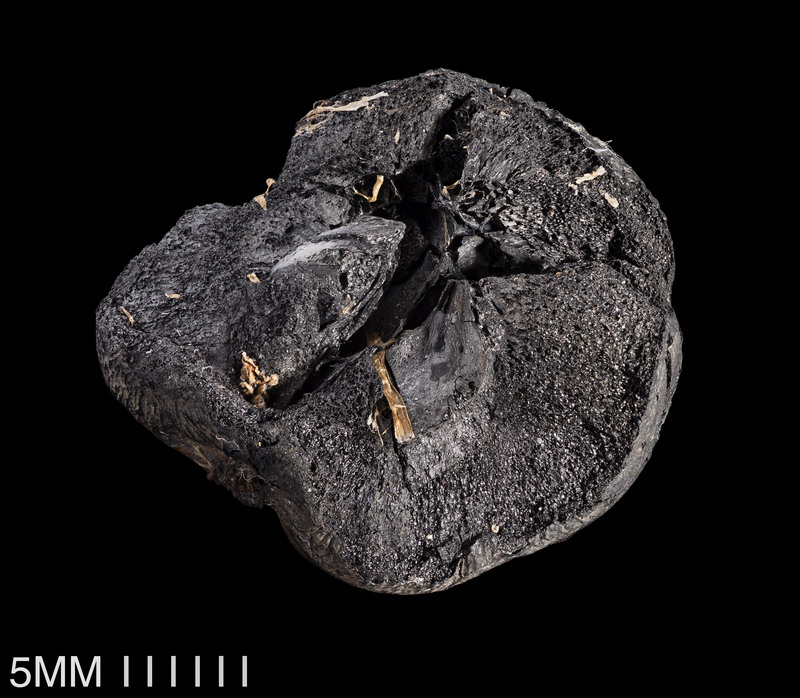 The charred apple (FID1211158) found in the Eastern trench at the pile dwelling. The pip of the apple is still in the core. Photo: Ola Myrin, SHMM. When I registered the apples from the eastern trench I had these time-machine experiences a lot, as 5000 year old apples are not something you see every day. At least I have not, and I would dare to say that not many other archaeologists have done so either. The most striking example of this was when I came across an apple (charred), that had been halved and burned at the pile dwelling and where the pip of the apple was still lying inside the core. I cannot explain why this grasped me but it did. Maybe because I know how easy it is for the pips to flip and slip out of the core when the apple is cut. An ordinary day life experience that did not happen. How odd. I guess that my time-machines represent both unusual finds and representations of Stone Age life that feel close to my own. I am looking forward to even more time-machine experiences working with the material. I wonder what will be next?